I normally leave the refashioning posts to my sister, but I did a little repurposing* of my own this weekend. My favorite 10 year old cheapo Ikea duvet cover had become threadbare and sprouted holes. I love the block prints and I wasn’t ready to dump it. Last spring, Joann’s was having a sale on cotton quilt batting. I decided to turn the duvet into a cotton blanket. This project has been sitting in my project basket since spring and I finally got around to it this weekend. 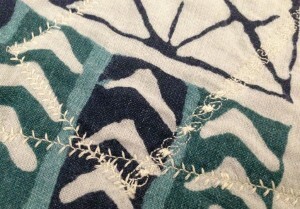 I played around with my Bernina’s decorative stitches to break up the lines of straight stitches. A few strategically placed scrap linen from another project covered up the major holes. Not the best sewing machine quilting job I’ve ever done, but it serves its purpose. I get to keep my favorite bed textile around for a while longer. Last week’s highs of 90F has now turned to night time lows of mid 40s. I think I missed the window where this blanket will be usable. This has turned out so well that I’m looking at wool batting for the next duvet cover turned blanket project to carry me through fall. But given my track record, I’ll finish in time for the next 90F spell. * Does this really qualify as a repurposing project? It’s original purpose was a blanket/comforter cover. I just turned it into a permanent blanket. It’s basic function hasn’t changed.